Busy day? Dogs love to come and play at Linker Learning Centre for Dogs for daycare! We match your schedule, making it easy for you and your dog on those long work days. 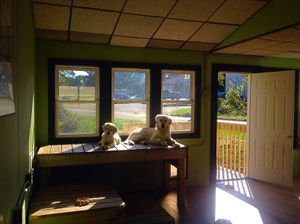 Here at daycare, your dog is matched with suitable playmates and spends all day romping around, playing king of the mountain on our daycare ramps, and enjoying the good weather using our doggy door into a fenced yard! Forget the cage, come and play! Daycare price is $15.00 a day per dog. Do you have a dirty dog? We can help! With our easy access bath and grooming table, we can get your dog looking their best in no time! Prices are quoted based on temperament, size, and fur length. We bathe, blow dry, brush, and clip nails for an affordable and fair price. Dogs love being pampered! During their stay, your dog will be shampooed, conditioned, blow dried, and groomed. Our all around grooming package also includes ear cleaning, nail clipping, and collar washing. We work to keep your dog stress and dirt free! fun in the mud on a wet spring day!